You might have noticed that more and more yoga selfies and photos of yoga products are being shared online. That’s just a small slice of the pie. You see, billions of dollars are being spent on yoga. Its popularity is not going away anytime soon. From a peaceful and detached spiritual activity, yoga has evolved into a billion dollar industry, with some yogis and enterprises reaping celebrity-status rewards. The paparazzi reports feature various models and entertainment personalities who also actively practice yoga as a lifestyle, which pushes the yoga craze to greater heights worldwide. The accessibility of this wellness practice is a contributing factor to its popularity. 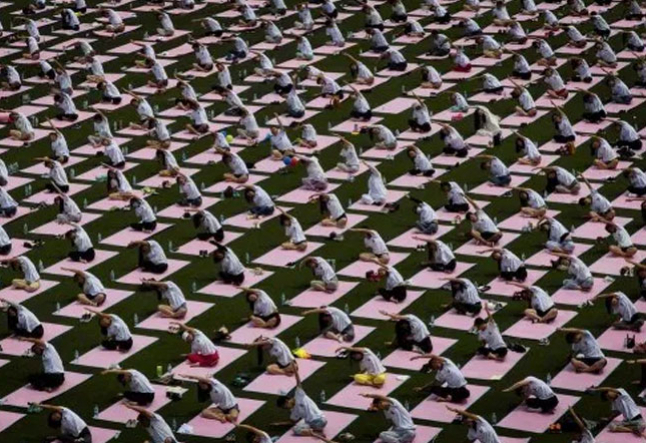 There is practically a yoga school in every city today. Now, there are over 300 million yoga practitioners worldwide working their way through various poses and stretches. Who gets the most benefit from this phenomenon? A majority of those who go to yoga classes aim for health improvement. Concerned about their mental and emotional wellness, the promise of stress relief is a powerful motivation for doing yoga. Generally, most yoga teachers don’t earn a fortune from teaching yoga classes. But one thing’s for sure: there are numerous products being sold to yogis. If you search the word “yoga” on Amazon, you will be greeted by galleries of products ranging from clothing, to video lessons, to mats, to the most basic of instruction manuals. Yoga styles are evolving from the most ancient to the barest one called Naked Yoga. You can even practice yoga with your dog. There is a yoga style for just about anyone. On a lighter note, statistics in this infographic below show that those who practice yoga don’t get sick as often compared to non-yogis. The infographic below - powered by dr-discount - Shows the "yogipreneurs" interesting insights about the yoga business. In the USA, yoga is the 4th fastest growing industry. The amount of money yogis are spending has risen with 87% in the last 5 years. Worldwide there are 300 million people who are practicing yoga according to the International Yoga Federation. In Japan especially, there is a growth of 413% in the last 5 years.